"The Duet belongs in the special league of such double-voiced texts as Temilola Abioye & Tade Ipadeola?s Voices (1996), Hannatu Abdullahi?s She Talks, He Talks (1998), and Amaka Azuike?s Tides of Time (2000), the remarkable difference being that it is the first congenitally bonded of notable dual-authored collections of modern Nigerian poetry. Most of the poems contained here are deeply personal and reflective, sprung on half and full rhymes, dealing with aspects of human desires and despair, hope and love, and generally composed as interlocking statements about life and living. To have a feel of the filial imagination in the poetic, this book is worth reading.? ?Toki Mabogunje is a lawyer, writer, poet and the Principal Consultant in the firm of Toki Mabogunje and Company which engages in private sector development of small and medium sized companies (SMEs). Toki began writing poems precociously at age six and has had her poetry published in various anthologies since 1998. These publications include Tranquil Rains of Summer (The National Library of Poetry USA, 1998), Peaceful Reveries (The Poetry Guild USA, 1999), A Melody of Stones (P.E.N. Nigeria, 2004)?published in honour of the 70th birthday of Nobel Laureate, Prof. Wole Soyinka, and Our Voice (International P.E.N. Women Writers Committee, 2005). 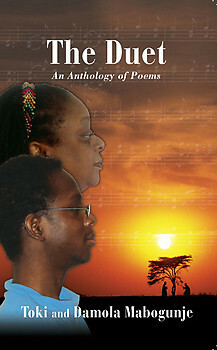 Toki is married with two sons, one of whom, ?Damola is her co-author of this anthology. Born on November 12, 1987, ?Damola Mabogunje has been writing and reading poetry since the age of ten with encouragement from friends and family. Despite being a science student in secondary school and a science major in university, he has always delved into "the arts". Now aged 21, after three years of secondary level literature (from "Abiku" to "The Archbishop of Canterbury"), two years of piano lessons, one year of tap dancing, six-plus years of French, two years of Chinese and three years of Japanese self-study, ?Damola conclusively says that his poems are "nothing extraordinary, but a collection of perspectives marking the bus-stops till one day the variables become constant and my young mind becomes defined (The Definition of Me).? So to all his "bus-drivers?, who have and still are helping him define himself, Damola says "Thank You".